Have you ever had a delicious meal but poorly served? Did you have to sweat getting a plate or a spoon? Yes, you may have had a delicious meal but how did you feel thereafter? The point here is one: the food at any wedding is as good as the style in which it is served. 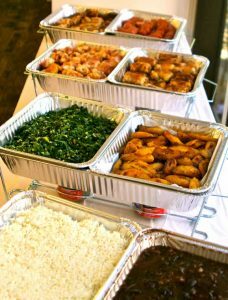 If you want to create an unforgettable experience for your wedding guests, you need to first understand the various wedding catering styles. Once you have done that, you will be able to choose a suitable style for your big day and allow your guests to enjoy. This style involves setting up a food station, usually on a long table, allowing guests to serve themselves. Stationing a waiter behind the table to help with serving is an option. It is important for the catering staff to remove any dirty utensils and refill the buffet dishes in time. This style offers hors d’oeuvres and various other small bites throughout the event. Typically, the hors d’oeuvres are a portion with a few bites (one to two) and can also be a blend of cold and hot menu items. Servers can be handy in passing around the bites, or a station for self-service can be set up. Cocktail style can be ideal if you need a more casual experience with much emphasis on socializing, drinking, and dancing. This is a style in which food is spread out in different stations erected at the wedding venue. A dessert station, a taco station, and a sushi station are some of the most common stations at wedding events. Typically, portions served at the stations are smaller, helping to present a more diverse and creative menu. It is the most formal and traditional style in which each guest is given a plated meal. Typically, this style presents guests with three courses: dessert, appetiser, and entrée.